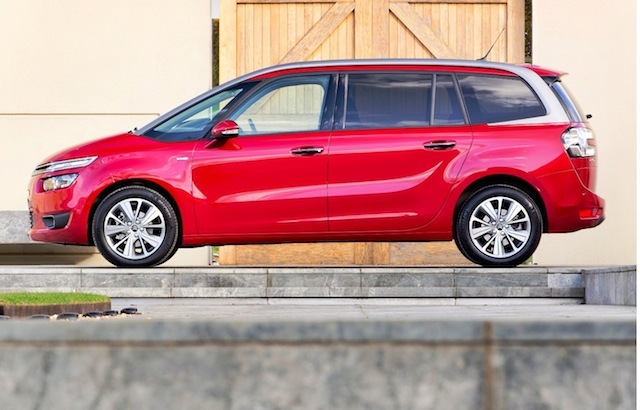 The all new Citroen C4 Picasso five seater was launched in August last year and now it is joined by the elongated seven seat ‘Grand’ versions with prices ranging from £19,200 to £27,855, around £1,700 higher than the shorter C4 Picasso versions. At the press launch last year for the C4 Picasso, Citroen estimated around 6,000 annual UK sales and around 10,000 for its ‘Grander’ seven seater model arriving now in dealerships. Such is the demand in the UK for MPVs (Multi Purpose Vehicles) with a record 150,659 sold here last year, Citroen have upped their predictions. John Handcock, Head of Citroen’s UK Press and Public Relations said at the press launch this week, “Much higher demand for the five seat C4 Picasso means we are predicting 7,000 sales in 2014 and 13,000 sales for the latest Grand C4 versions”. He added, “Around 90% of Grand C4 Picasso UK sales will be diesel powered models, around 60% of customers will choose a manual gearbox, 75% of customers will be fleet and business user-choosers and a ‘good chunk’ of fleet sales will be to Mobility scheme members”. Handcock said the most popular version will be the 1.6 e-HDi 115 (113bhp) 6-speed manual version with VTR+ specification priced at £21,995. This version will officially return 70.6mpg with CO2 emissions of 105g/km which means VED road tax is £0 for the First Year rate and just £20 for year two onwards. Company car drivers will pay 16% Benefit-in-Kind tax and insurance is rated at band 19A. He said the new Grand C4 Picasso, which uses Citroens EMP2 platform, is 110kg lighter than the outgoing versions so CO2 emissions are an average 30% lower. The headline lowest figure comes from the 1.6 e-HDi 90 Airdream version with the 6-speed electronic automated gearbox which will return 74.3mpg with 98g/km of CO2 so VED road tax is £0 for all years and BIK company car tax is down to 14%. All diesel powered models have stop/start as standard and all models have a Euro NCAP 5-Star safety rating with traction and stability controls as standard. The full range of engines are; a 1.6 normally aspirated petrol unit with 118bhp, 1.6 THP, 156bhp turbo petrol and turbodiesel unit choices are 1.6 e-HDi 90bhp, 1.6 e-HDi 113bhp and a new 2.0 BlueHDi 148bhp version. The current 90/113bhp e-HDi engines will be updated emission-wise to Euro 6 specification at the end of this year to become BlueHDi units. Specification levels available, depending on the choice of engine are, VTR, the best selling VTR+, Exclusive and Exclusive+. By adding 110mm to the length of the wheelbase of Citroen’s lightweight EMP2 platform not only is a third row of seats added to the Grand versions of the C4 Picasso but the middle row of three individual units also slide fore and aft to maximise the legroom and to fold and slide forward to give easy access to the rear row of two individual seats. The rear passenger doors are conventional side hinged units, not the sliding type. 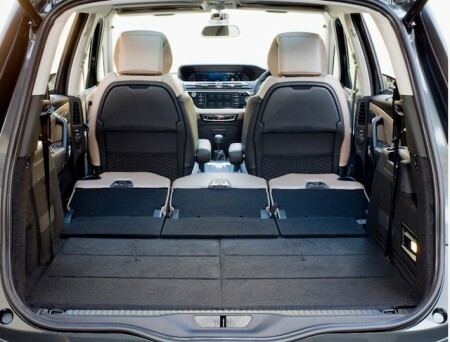 All the seats in the middle and rear row fold down individually with a very simple one-handed move so the seating and load carrying combinations are numerous and there is even stowage room for the rear parcel shelf so it doesn’t clutter up the carrying space. All five rear seats also fold down to give a completely flat load floor and even the front passenger seat-back folds flat to extend the interior length to nine-feet for carrying long items. 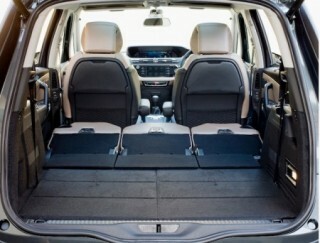 With all seven seats in use there is only 165-litres of boot space but in the most used five seat configuration this goes up to 632-litres and with all five of the rear seats folded down flat the load space is a huge 2,181-litres so it’s not only a people carrier it’s a load carrier as well. So the predicted high proportion of fleet and business user-choosers sales expectations are justified because the Grand C4 Picasso is ideal and relatively cost effective to use by businesses, fleets, taxis, minicab and executive chauffeur operators. That isn’t to say the newcomer is just a workhorse. Inside the specification and quality is that of a passenger car and huge glass areas make it light and airy, in particular the huge windscreen which stretches up and over the front seats makes visibility for the driver about as good as it gets. For most versions the very modern dashboard is dominated by two colour screens one of which does away with most switches and buttons and gives access to standard and optional functions such as interior temperature/heater controls, park assist, blind spot, sound system, navigation, fitted, internet connection and Bluetooth. No control is more than two touches away from selecting the mode required. The upper 12-inch screen, depending on the specification, shows a mix of the digital speedometer and sat-nav. 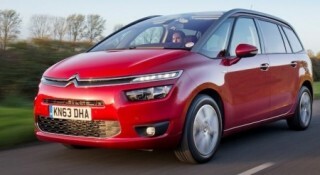 The Grand C4 Picasso seven seater isn’t just a longer version of the five seat model. The styling of the front, side and rear is different giving it a more athletic appearance rather than the styling of some MPVs which tend to look like vans with windows. Enhancing the sportiness of the vehicle are alloy wheels fitted to all models and these range from 16 to 18-inches. Standard specification includes daytime running lights, two tone soft touch upper dashboards, 7-inch touch drive screen, air conditioning, front and rear electric windows, puncture repair kit, but a space-saver spare wheel option is available for an extra £75, ABS braking, stability and traction control, front and curtain airbags, cruise control and a six-speaker sound system. The best selling VTR+ additions include electrically operated and heated door mirrors, automatic lights and wipers, front fog lights, adjustable front armrests, more under-seat storage drawers, rear parking sensors, fold-down tray tables integrated in to the back of the two front seats, dual zone automatic air conditioning and DAB digital radio. The spec goes higher with Exclusive and Exclusive+ and of course there is a further choice with extra cost options which include sat-nav for the VTR+ at £550 but that is standard on the Exclusive versions. At the media launch I opted for the 1.6-litre 115 e-HDi turbodiesel 6-speed manual version, by far the best selling engine and transmission but the test cars had Exclusive specification not the best selling VTR+. The test vehicle weighed in at £23,255 but a drop to the VTR+ spec lowers that price to £21,955. The engine we know well in other Citroen and Peugeot models with its 113bhp and 270Nm (199lb ft) of torque delivered from just 1,750rpm. It’s strong, responsive and not unduly noisy; in fact it is the engine most users can live with very easily. It is especially easy on the pocket because officially it will return 70.6mpg but of course in real life that isn’t the case. During my relatively short test drive on busy, wet winding roads around Oxfordshire the fuel consumption was still impressive at 52.2mpg. With CO2 emissions for this version rated at 105g/km road tax is zero cost for the First Year rate and then only £20 for year two onwards. Company car drivers will pay 16% Benefit-in-Kind tax, not that much really for such a practical and useful vehicle. Insurance is 18E. The ride comfort was really very good although the Exclusive version has the larger 17-inch wheels so the 16-inch one used for the VTR+ are likely to give an even better ride. The handling seemed better balanced over the standard five seat C4 Picasso and it appeared to give a flatter ride with the rear suspension in particular being less unsettled when coping with impacts from worsening potholes. I did have a very short run-out with the 2.0-litre BlueHDi 150 turbodiesel, just because the engine is new and a forerunner to other BlueHDi diesel units which will be introduced at the end of the year. Yes the extra power or 148bhp is noticeable but unless you are spending very long hours driving at high motorway speeds it is not necessary. Although at 9.8 seconds from zero to 62mph it is much quicker than the 12.1 seconds of the 1.6 e-HDi. Most surprising of all were the low CO2 emissions for an engine of this size – just 113g/km with an official fuel economy of 65.7mpg. On my test the real-life figure was 42.1mpg. I can see why my media colleagues at What Car? magazine have voted the Grand C4 Picasso their MPV of the Year, why Top Gear magazine has made it their Family Car of the Year and why it is a finalist in the European Car of the Year competition. Such accolades cannot be wrong. 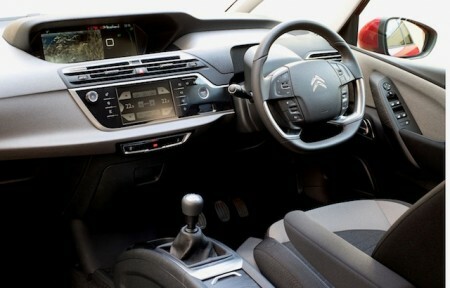 Citroen Grand C4 Picasso 7-Seat MPV, 1.6 e-HDi 115, Exclusive, 6-speed manual. Price £23,255 (best selling VTR+ version £21,955). Engine/transmission: 1.6-litre, 4-cylinder turbodiesel 113bhp, 199lb ft of torque from 1,750rpm, 6-speed manual. Performance: 117mph, 0-62mph 12.1 seconds, 70.6mpg Combined Cycle (52.2mpg on test), CO2 105g/km, VED road tax £0 First Year rate then £20 year two onwards, BIK company car tax 16%. Insurance group: 18E. Warranty: 3-years/60,000 miles. Dimensions/capacities: L 4,597mm, W 1,826mm, H 1,656mm, 7 individual seats, boot/load space 165 to 2,181-litres, braked towing weight 1,500kg. For: Smart looks, easy access, practical, versatile and comfortable interior, excellent visibility, easy to drive and park, high level of specification, fuel and tax efficient, well priced. Against: Headroom low in third row of seats for adults, fiddly touch-screen controls.